Check out my " tumblr log " for some other kinds of news. Purdue did a news feature on my work with deception. It is available online. Spaf is a recipient of the indicated honor. Presented at the annual ISE conference in Chicago, November 8. 2018 is the 30th anniversary of the Internet Worm and my analysis of it. One online interview in the podcast "Malicious Life" with me this year was about the incident: Part 1 and Part 2. Spaf will be taking his first real sabbatical leave of his academic career. Phew! He will be on leave, working at various locations, from August 1, 2018 until August 15, 2019. Spaf provided the keynote for the 18th annual DFRWS. Spaf is chairing the NACE Workshop being held prior to the CISSE Symposium in New Orleans. This was the 20th anniversary year of the founding of CERIAS (last year was the 25th anniversary of COAST). The annual symposium featured a number of former keynote speakers and new content. Videos are online at the site. In August, I noted quietly that I have been at Purdue for 30 years. 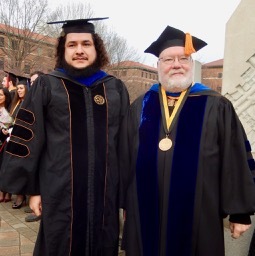 Two of my PhD students -- Jeffrey Avery and Chris Gutierrez -- graduated with their PhDs this year. Both were working in the area of using deception to protect computing systems. Both were co-advised by Saurabh Bagchi. Spaf was announced as the 2017 recipient of the Kristian Beckman Award . He delivered an invited address at the 32nd International Conference on ICT Systems Security and Privacy Protection ( IFIP SEC 2017 ) in Rome, in May 2017 as part of the formal award presentation. Spaf was in India from Jan 29-Feb 3 as this year's lecturer for the India-Purdue Collaborative Lecture Series in honor of Bharat Ratna Professor C.N.R Rao. This included speaking engagements at IIT Delhi, the American Center in Delhi, and presentations at FlipKart, Cisco, and GE Labs. Spaf was named as a Sagamore of the Wabash , Indiana's highest civilian honor. This is the Purdue press release about the award. I spoke in the UNH Alvine Lecture Series in May. You can watch it here. Spaf sets up an endowment for his undergrad alma mater. It's an open fund that anyone else can contribute to, so think about it!. Professor Spafford received the Outstanding Research Award from ITERA in April, at their conference in Louisville. Spaf presented a paper at the ACSAC conference , written with students Mohammed Almeshekah, Chris Gutierrez, and colleague Mike Atallah. The paper, entitled ErsatzPasswords: Ending Password Cracking and Detecting Password Leakage , won "Best Paper" honors! Spaf was featured in the Distinguished Lecture Series at Texas A&M University . Spaf was one of the featured speakers at Purdue's " Dawn or Doom 2 " special event focused on potential perils of new technologies, featuring special guest, journalist Barton Gellman. Spaf's talk, and the talks of the other presenters, are now available online via Purdue's E-pubs site. Spaf was a featured speaker at Google's Security & Privacy week. 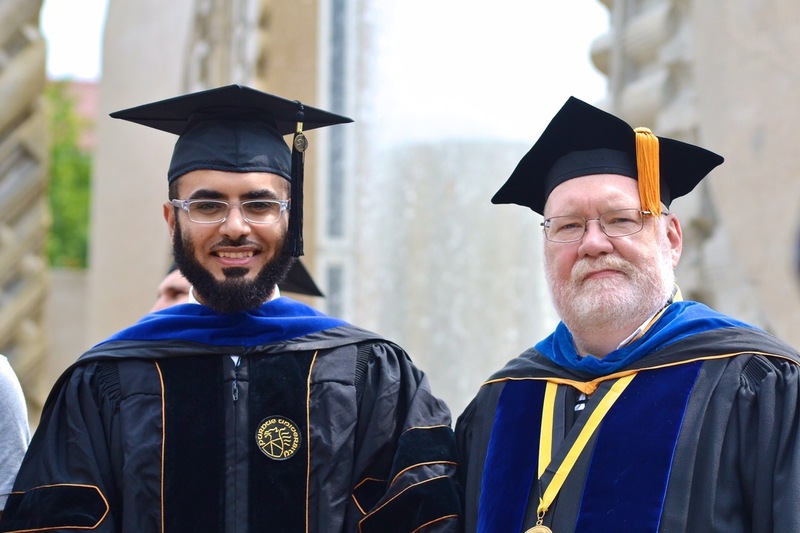 Mohammed Almeshekah received his Ph.D. degree in August, and joined the faculty of King Saud University, in Saudi Arabia. His Ph.D. dissertation was entitled Using Deception to Enhance Security: A Taxonomy, Model, and Novel Uses . Spaf traveled to Sweden for a board meeting of the COINS advisory board (he is a member). While there, he provided a keynote talk at the NordSec Conference about his work in deception for better security. Spaf's "Liarsclub" research group , exploring the use of deception in cyber defense, won NSF EAGER funding. Spaf provided talks at several events, including the Indianapolis ISSA, and the University of Central Florida. Spaf was confirmed as a Fellow of the Ponemon Institute at its most recent conference in November. Spaf will be the keynote speaker at the 25th anniversary dinner for the SUNY College at Brockport Computer Science department. He is a 1979 grad of what was then the joint Math-CS department, and was named as department scholar in CS at that time. He also has received an honorary degree from SUNY. Spaf will be providing one of the afternoon keynote addresses at the 10th European Computer Science Summit ( ECSS ) held in Wroclaw, Poland. Spaf was one of the featured speakers at Purdue's " Dawn or Doom? " special event focused on potential perils of new technologies, featuring special guest, author James Barrat. Spaf's talk, and the talks of the other presenters, are now available online via Purdue's E-pubs site. Spaf has been named as a member of Verified Voting's Board of Advisors . He has also been appointed as chair of SignaCert 's Board of Advisors. Spaf is giving a distinguished lecture at Clemson April 3, and an ITI Distinguished Lecture at the University of Illinois on April 30. The title of the presentation is "Why Aren't Our Systems Secure?" Spaf was named one of the top 10 InfoSec Career Influencers by the Information Security Media Group (ISMGG). 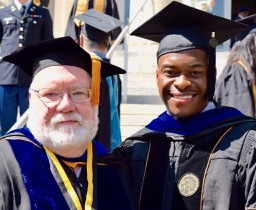 On December 16, my most recent PhD student, Dannie Stanley, Ph.D., graduated. Prof. Dongyan Xu and I were co-advisors. Dannie has joined the faculty of Taylor University as an assistant professor. Spaf was interviewed by Jeffrey Yost of the Babbage Institute. His oral history has been included as part of their archive. Spaf will provide one of the subject-matter expert keynotes at the Naval Academy's Science and Engineering Conference in early November. Spaf will be (jet-lagged) and in New York City for the ACM Council meeting. Spaf will provide a talk at the World Knowledge Forum in Seoul Korea, October 14-16. One of the keynote addresses at the ISSA International Conference will be provided by Spaf; October 9-10. Spaf will be in Moline, IL on Sept 10 to provide an address to the University-Industry Demonstration Partnership evening reception. Spaf is the 2013 awardee of the (ISC) 2 Harold F. Tipton Lifetime Achievement Award . 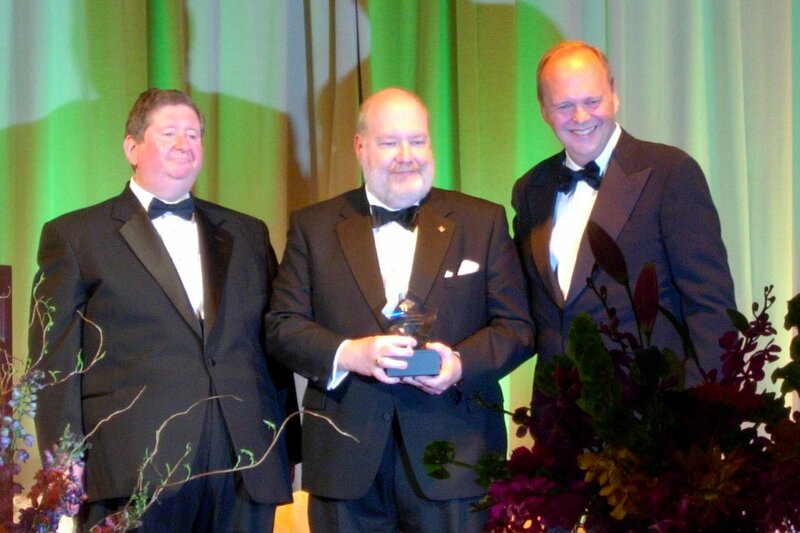 Spaf was named as one of the 2013 inductees to the National Cyber Security Hall of Fame . Spaf attended the formal change of command ceremony for his former Ph.D. student, Lt. Colonel Paul V. Williams, USAF. Paul was the commander of the 26th Network Operations Squadron for two years, and now is going to a posting at the Pentagon. Paul got great reviews, best wishes, and a medal for his time at 26 NOS. In late August, Spaf was honored to officiate at a wedding between two of his former students! Best wishes to Mike & Jackie in their future together. Spaf participated in a program review at Sandia National Laboratories in New Mexico in August. Spaf was in San Francisco June 14-16 for the semiannual ACM Council meeting and awards banquet. May 6th, Spaf attended the semiannual Northrop Grumman Cybersecurity Research Consortium research review meeting in Tysons Coirners, VA.
Spaf joined the group for their Maymester in DC with a class at C-SPAN . In May, a class of undergraduates that Spaf taught, presented their results in reverse engineering to an audience at the National Cryptologic Museum . In late April, Spaf attended an NSF-sponsored workshop on interdisciplinary cyber security, chaired by Lance Hoffman. He was a member of the steering committee. April 9th, Spaf hosted distinguished visitor, Norman Augustine . April 5th was the conclusion of a year of celebration of the Purdue CS Department's 50th anniversary . Spaf, along with several other Purdue personnel, attended the annual RSA Security Conference in San Francisco in February. Spaf was once again in Charleston, SC, this time with daughter Elizabeth, from December 28-January 1, attending the annual New Year's Renaissance Weekend conference. As part of Spaf's side consulting business , he spent several weeks in December In Delaware as an expert witness and consultant for a patent lawsuit. Once again, Spaf attended this fascinating annual event . The US Naval Academy's Cyber Center for Security Studies Advisory board, with Spaf as a member, met in mid November. Spaf visited Japan to give one of the keynote talks at the MIST12 workshop in early November. Spaf provided one of the invited keynote addresses to the ICDFC2 conference in late October. Spaf attended his first ACM Council meeting as a member-at-large in New York City on October 12. October 5th was the kick-off for a year of celebration of the Purdue CS Department's 50th anniversary . In September, Spaf spent a week in Korea visiting colleagues, including a visit to Soonchunhyang University. Spaf was in San Francisco June 14-16 for the semiannual ACM Council meeting, and for the ACM A.M. Turning Centenary Celebration . Spaf will be providing the invited dinner address at the Optics and Novel Ideas international workshop being held at Purdue's Discovery Park on May 31. May 21-23, Spaf is attending the semiannual Northrop Grumman Cybersecurity Research Consortium research review meeting. This one is at the NGC location in Tysons Coirners, VA.
Spaf is in DC for an Air Force review panel May 9th. 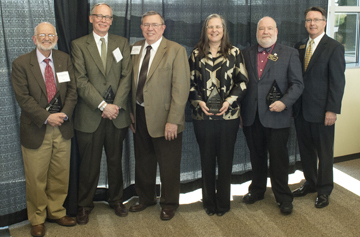 At the Purdue Faculty Honors Convocation on April 26, Spaf was one of five faculty awarded the new university Morrill Award . Spaf is part of an external review panel for the CSE department at Texas A & M University. Spaf gave the invited Frank Howard lecture at George Washington University on April 11. Past lecturers include acclaimed scientists and engineers Dr. Barbara Liskov, Dr. Mihail Roco, Dr. Frieder Seible, Dr. Werner Von Braun, Dr. Edward Teller, and Dr. W. Edwards Deming; Nuclear Regulatory Commission Chairman Dr. Shirley Jackson; U.S. Representative Clifford Stearns; former Lockheed Martin Chairman & CEO Norman Augustine; and structural engineer of the World Trade Center, Leslie E. Robertson, P.E. Spaf is in DC for an Air Force review panel April 10. April 3rd and 4th is the annual CERIAS Spring Security Symposium . Spaf is the general chair and is participating as a speaker in the "fireside chat" with Art Coviello, CEO of RSA, and Howard Schmidt, Presidential Cyber Security Advisor. (Registration for the symposium is open until the morning of the 4th.) On April 5th, he's chairing the semiannual CERIAS External Advisory Board meeting. Spaf is the featured speaker at a salon on cyber security, sponsored by the Global Policy Research Institute , in Washington DC on March 28. In a "twofer" on March 8, Spaf spoke at the NJ Lockheed Martin research lab, and then spoke at Drexel University. Spaf attended the 2012 RSA Conference in San Francisco from February 28 to March 2. Spaf, in his role as chair of USACM, led the annual meeting in Washington, DC on February 9 & 10. Spaf participated the U.S. Naval Academy Center for Security Studies advisory board meeting, in Annapolis, MD. On January 26th, Spaf was a featured speaker at the Global Policy Research Institute Dinner in Washington, DC. On January 12th, Spaf met with Congressional staff to talk about the SOPA and Protect IP bills in his role as USACM Council Chair. Spaf was in Charleston, SC from December 28-January 1, attending the annual New Year's Renaissance Weekend conference. December 6-9, Spaf was in Orlando for the annual CSAC conference. November 9-16, Spaf participated in the Air University Board of Vistors , convened at Air University, Maxwell AFB, Alabama. The week of November 7th, Spaf was in San Diego, attending the Anti-Phishing Working Group conference, and giving one of the conference keynote addresses. On November 4th, Spaf attended the ACM Council meeting in New York City. On October 17th, Spaf provided the "Midnight Seminar" at Telcordia in NJ, and broadcast to all their locations. Spaf provided an invited seminar talk talk at Raytheon's Southern California location, broadcast throughout the company, on October 12. September 28th-30th, Spaf visited Sandia National Laboratories, partly as a research visit, and partly for the semiannual CERIAS External Advisory Board meeting. Sandia is a CERIAS partner. Spaf addressed a workshop for the Federal CIO Council at the National Defense University September 8. Spaf is serving as the honorary chair of this year's ARES Conference , and will be giving an invited address at the conference in Vienna on August 22nd. 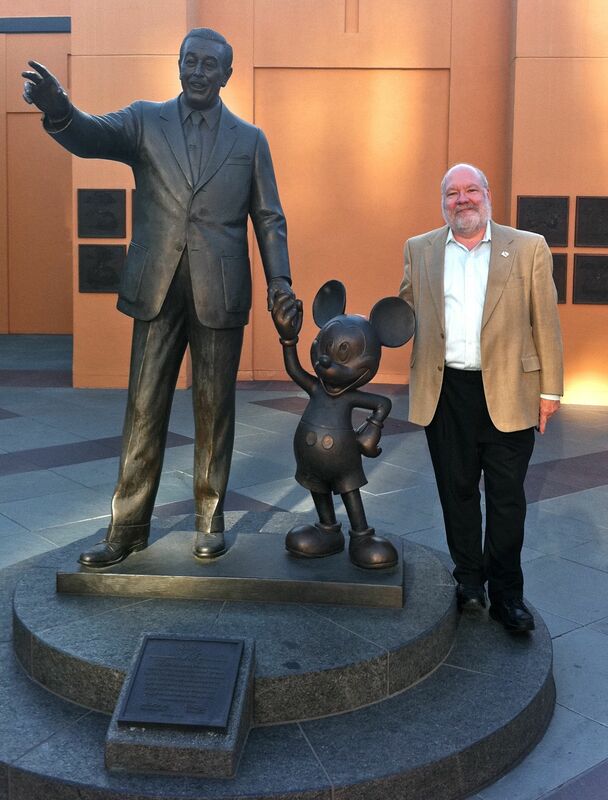 Spaf was keynote speaker July 31st at The Walt Disney Company Security, Compliance & Privacy Summit held at Disney Studios in California. Spaf was in Las Vegas at WorldComp 2011. He delivered the 2nd keynote lecture on Monday morning, in the Monte Carlo Theater, entitled "The Nature of Cyber Security." The slides from the talk (showing builds) are available online , although there is no video -- there were many comments and expansion of the points on the slides that I presented verbally. In Recognition of His Leadership, Outstanding Research Contributions, and Pioneering Work in Computer Security. Spaf appeared at the National Press Club as part of a press event covering progress on the Northrop Grumman Security Consortium. On May 4th, Spaf testified before the House Energy and Commerce Subcommittee on Commerce, Manufacturing, and Trade on the topic of The Threat of Data Theft to American Consumers . His testimony was on behalf of USACM . Spaf was presented with a Lifetime Achievement Award by Lance Spitzner of SANS at a ceremony at Purdue University on March 1st, recognizing his many contributions to security education and research in his career to date. Gene made some remarks, a few of which are repeated in one of his blog postings . I participated in a AAAS Policy panel on cyber security on November 3rd in Washington, DC. Spaf is providing the keynote talk at the Computer Science Teachers Association's Computer Science and Information Technology Symposium 2010 on July 13 at Google in Mountain View. Spaf was named as one of the 2010 Security Visionaries by "The Everything Channel." Spaf is giving one of the keynote talks at the ARES Conference in Krakow Poland, Feb 15-18. Spaf has been named as the chair of the CSTB/NRC Committee on Depicting IT in Innovation . Spaf has been named as the new Editor of the oldest journal in information security: Elsevier's Computers & Security. We're on the lookout for great articles, so give it some thought! Spaf will be participating in the first Madison Policy Forum on Cyber Security in NYC on October 27th. Spaf was named as a "Distinguished Fellow" of the ISSA . Spaf gave a Distinguished Lecture at Virginia Tech on October 9. Spaf presented the Monday morning keynote talk at this NSF Conference on September 14. Spaf delivered a distinguished lecture speaking at Tufts University on September 10. Spaf was in San Diego for the ACM Council meeting and the ACM Awards ceremony , June 25 and 26, respectively. Spaf gave one of the keynote talks at the IFIP Trust Management Conference being held at Purdue, June 16-19. Spaf testified before the Senate Commerce Committee on cyber security and education. His written testimony is available online . Spaf has been named as recipient of the 2009 CRA Distinguished Service Award . Being held February 25 and 26, the panel is also being webcast . Spaf was a guest on C-SPAN's Washington Journal program on February 21. You can watch a recording of that session . The Secretary of Defense, Robert Gates , has appointed Professor Spafford to the U.S. Air Force Air University Board of Visitors . The Board is composed of members who are eminent authorities in the field of air power, defense, management, leadership, and academia. Members provide the Secretary of the Air Force , through the Commander, Air University and the Commander, Air Education and Training Command , independent advice and recommendations on matters pertaining to the educational, doctrinal, and research policies and activities of Air University. Spaf has been named as the 2009 recipient of the UPE Abacus Award . He will receive the award at the 2009 Annual Convention of UPE held on Friday, March 6, 2009 in conjunction with the ACM SIGCSE Annual Conference . Spaf is speaking at the Founder's Day celebration . October 5th & 6th, Spaf will be speaking at the Tech Target Information Security Decisions conference Chicago. While there he will received one of the Security 7 awards. Spaf was interviewed by Forensic Focus . Spaf was interviewed in the September 13th issue of Science News. The article is also available online . Spaf gave a talk to the local community on September 8 about the technology used in voting, and some of the problems with electronic voting machines. A resource page is available online. Spaf spoke at the graduation conference of the 2008 MSIA graduating class at Norwich University in Vermont on June 9. Spaf gave a talk on the balance between security and privacy at the 2008 ISIPS workshop . CERIAS is #1 in Information Security! Academic Analytics, a private firm that rates academic programs, has determined that Purdue's CERIAS program is the #1 in information security -- and they didn't even count all of the faculty involved! Spaf will present one of the Distinguished Lectures at FIT on February 1. Spaf gave two talks in Pensacola, Florida at the Institute for Human-Machine Cognition. The evening talk on January 30 will be open to the public. One of them is on YouTube . Information Security magazine's 10th anniversary issue mentions of Spaf as someone who has helped shape information security. On December 3rd & 4th, Spaf will be speaking in the Distinguished Lecture Series at Kansas State University. November 30th, Spaf will be speaking in the Distinguished Lecture series at Indiana University in Bloomington. On the evening of November 13th, Spaf will be presenting a talk on voting technologies in the Purdue Pugwash Presents series on campus . Howard Schmidt, Bruce Schneier, and Spaf were part of a " Crystal Ball Panel " at the Information Security Decisions conference in Chicago. Some press coverage of the event here . Spaf was part of a "prelude" to the Purdue appearance of the Myth Busters. You can view the entire show online . Spaf was interviewed by Gary McGraw as part of the "Silber Bullet" interview series for IEEE. Forbes has an interesting article about on-line privacy: Anonymity & the Net by Victoria Murphy Barret. The folks at Giganews have added an interview with Spaf about the early days of Usenet to their Usenet History site . Spaf was quoted at length in an article on cyberwarfare printed in Network World . Richard Ford and I wrote a commentary for Science Magazine on computer viruses. 2007 is the 25th anniversary of the malicious computer virus. Scientific American did a story on the story. Spaf presented the evening banquet keynote talk at the 2007 SERC Spring Showcase, held at Purdue. Spaf spoke in the Distinguished Lecture Series at Temple University on April 19. Spaf was one of the speakers at the Security and Liberty Forum held at the University of North Carolina on April 14. Spaf attended the national LANGURE conference in Raleigh, NC, from April 12-14. Spaf was one of the featured speakers at a symposium on voting machines and e-voting being held in honor of Bill Wulf. This will be February 8th, at the Beckman Center in Irvine, CA. Spaf is profiled in an article in the January 9th issue of The Exponent, the campus newspaper. As of 2007, Spaf is also an Adjunct Professor of Computer Sciences at the University of Texas at San Antonio, and is Executive Director of the Advisory Board of the new Institute for Information Assurance there. Spaf was interviewed for an article in ComputerWorld about e-voting security and reliability. This follows on other such interviews, and the efforts of the USACM towards verifiable votes. Spaf was named as one of the " 50 Most Powerful People in Networking " by Network World . Spaf spoke in the Distinguished Lecture Series of the University of Delaware on December 6th. (Postponed from November 17th.) It was covered in the campus newspaper . Spaf was a speaker and panelist at a conference on Cyber Security and the Law , held at Georgetown University, November 9 & 10 and cosponsored by ISSA. On October 20, Spaf presented a seminar lecture on cyber security at University College in Dublin, Ireland. Spaf has been named as the recipient of the 2006 Outstanding Contribution Award of the ACM Special Interest Group on Security, Audit and Control. Spaf presented the keynote talk at the IEEE Fort Worth (Texas) MetroCon on October 4. Spaf was the keynote speaker at the Motorola Security Conference, Security on the Horizon, in Itasca Illinois on September 14. Spaf was selected by the ISACA New York Metropolitan Chapter as the 2006 recipient of their Joseph J. Wasserman award for, in their citation, ... your overall body of work and contributions to the information security profession. As a member of the CRA Board of Directors, Spaf attended the CRA Board meeting and annual Snowbird Conference in Utah, June 24-27. On June 22, Spaf testified before the US House Committee on Veterans' Affairs regarding information security. A copy of his written testimony is available online . Spaf gave the keynote presentation at the National Colloquium on Information Systems Security Education ( NCISSE ) on June 6. Spaf was recently interviewed by Network World magazine. Spaf provided a keynote presentation at the (May) 2006 AusCERT Conference at the Gold Coast, Queensland, Australia. A few days prior to that, he provided a public lecture at Queensland Institute of Technology (QUT) . 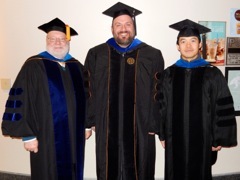 My two most recent Ph.D. students received their degrees. Left to right in the picture are Rajeev Gopalakrishna (#16), me, and Brian Carrier (#15). 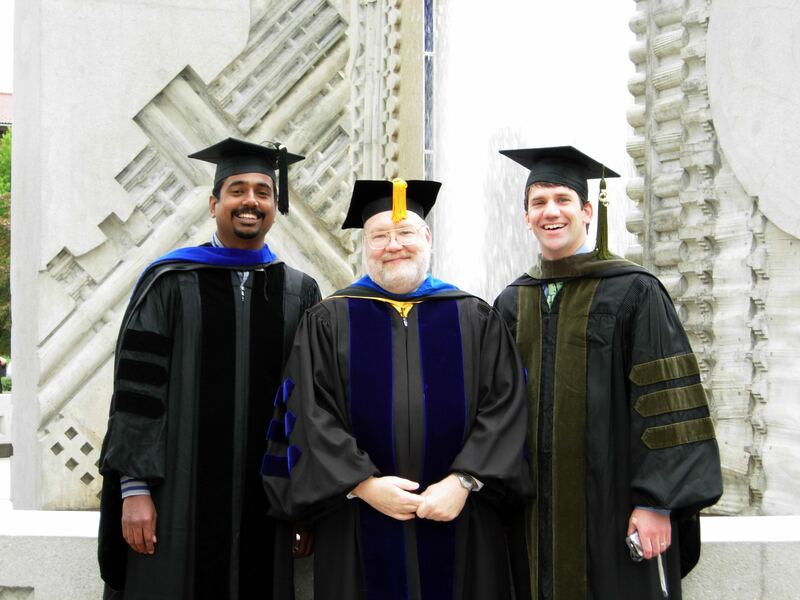 Brian and Rajeev received their degrees May 14th. Both are headed to labs in the commercial sector, with Brian at Basis Technology and Rajeev at Intel Corporation . Spaf presented in the Fermilab Colloquium series on May 10. On April 24th, Spaf presented in the Distinguished Lecture Series at Tufts University . On April 6, Spaf presented in SUNY Buffalo 's Distinguished Lecture Series . On April 1, Spaf addressed the Indiana League of Women Voters conference on the topics of computerized voting machines and HAVA-mandated state-wide databases. Spaf delivered the keynote address at the conference Innovations in Digital Forensic Practice on March 28 in Washington, DC. On January 30th, Spaf delivered the keynote address, Research Challenges in Digital Forensics: Science, Technology and Policy in Orlando, FL at the Conference on Digital Forensics . Spaf was one of the speakers in the 2006 January Series , held at Calvin College in Grand Rapids, MI. He is speaking on January 5, and the title of his talk is You're Almost on Your Own: The State of Computer Security . While at Calvin College, Spaf was interviewed for the TV show Inner Compass . This show was broadcast on January 22nd, and is available via streaming video from their WWW site (see item #611, partway down the page). Spaf provided one of the keynote addresses at the first ISSA e-conference. You can view the archived presentation. On October 26, at 9am (EDT), Spaf was part of a panel testifying before the House Armed Services Committee in Rayburn 2118. The topic was "Cyber Security, Information Assurance and Information Superiority" and Spaf's written testimony is online. An article in the Oct 5th issue of FCW quoted Spaf at some length. On September 29th & 30th, Spaf was a guest speaker at the Norwegian University of Science and Technology (NTNU) in Trondheim, Norway. On August 6, three of my Ph.D. students received their degrees. Left to right in the picture are Jim Early (#13), Florian Buchholz (#12), me, and Paul Williams (#14). All three are now assistant professors in academia. Jim is visiting at Purdue, Florian is with the faculty at James Madison University, and Paul is with the faculty of the Air Force Institute of Technology (he is an active-duty major (select) in the US Air Force). And no, not all of my students are than much taller than me -- only most of them! On July 26th, Spaf was one of the presenters at a luncheon presentation on cyber security for the Advisory Committee for the Congressional Research and Development Caucus. The event was sponsored by the IEEE USA . The event was reported in an IEEE publication and in an article in Red Herring. President Bush allowed the PITAC to expire without renewal on June 1st. This is unfortunate as there were many other issues to explore. However, the group's third and final report issued on June 16: Computational Science: Ensuring America's Competitiveness . On May 14th, Spaf was presented with an honorary D.Sc. (Doctor of Science) from the trustees of the State University of New York (SUNY). This was awarded at the spring commencement at his alma mater, the State University of New York College at Brockport . A copy of the citation and his remarks are available. Spaf was interviewed for the magazine Public CIO . The interview is online . Spaf provided one of the keynote presentations at the innaugural symposium of the new Institute for Digital Security at the University of Denver on April 8. Spaf joined with 16 other professors in an amicus brief in the MGM vs. Grokster case. The amicus is linked in to the EFF page on the case -- see the section entitled "Amicus Briefs Supporting Respondents." On February 18, Spaf spoke in the Distinguished Lecture series at ETSU. On February 11, Spaf spoke in the Distinguished Lecture series at UT Dallas. On December 3, Spaf presented a Distinguished Colloquium at the College of William and Mary. On November 16, Spaf presented as one of the Director's Colloquium Speakers for 2004. He spoke about " Grand Challenges in Information Security," based on the CRA Conference of the same name. The next day, on the 17th, Spaf was at SMU delivering a talk on the "Past, Present and Future of Information Security." On November 8th, Spaf presented one of St. Michael's Centennial addresses. He spoke about " Grand Challenges in Information Security," based on the CRA Conference of the same name. October 1, the John Marshall School of Law is sponsoring a symposium in Chicago entitled " Election 2004: Making of a President or Another Legal Precedent? The legal aspects of e-voting. " Spaf will serve on a panel discussing the pros and cons of DRE voting machines. Spaf was the invited speaker for the fall university convocation at Texas A&M-Commerce on September 10. Spaf led two panel sessions at this year's CRA Snowbird conference , July 11-13. He is also a member of the CRA Board of Directors , which met at the conference. For his outstanding contribution to both the technical and public policy aspects of protecting the global cyberspace infrastructure. The PITAC held their first public meeting in Washington, DC, on May 13th. As a member, Spaf was present, and the group heard presentations by a number of people working in cyber security. The PITAC is examining funding and research in this area this year. Spaf was recently interviewed on-line by GrepLaw. Spaf delivered one of the keynote talks at the 2004 ACM SIGCSE Technical Symposium on Computer Science Education , March 3-7. Spaf has been named as the 2003 recipient of the IEEE Computer Society's Taylor L. Booth Award . The award consists of a bronze medal and a an honorarium, and is presented for an outstanding record in computer science and engineering education. The individual must meet two or more of the following criteria in the computer science and engineering field: achieving recognition as a teacher of renown; writing an influential text; leading, inspiring or providing significant education content during the creation of a curriculum in the field; or inspiring others to a career in computer science and engineering education. Spaf received one of the new Brass Acorns for contributions to research. Along with this, a tree was planted on campus to match the "acorn." Spaf was interviewed by WISH-TV in Indianapolis as part of an investigative report on the problems with electronic voting technologies. The report was aired in three parts, and Spaf was featured in all three parts. Here are transcripts of part 1 , of part 2 , and of part 3 . Spaf presented the invited "classic" paper at the 2003 ACSAC conference in Las Vegas. The paper was entitled A Failure to Learn from the Past , and was about the Internet Worm and what we (haven't) learned in the 15 years since then. Spaf presented an invited talk at the annual Department of Defense Cybercrime Investigators' Conference in Las Vegas. The talk was on the future challenges facing investigators based on technology trends. Spaf is co-chair of the Computing Research Association 's 2nd Grand Challenges Conference . This conference was on the topic of Information security and was held November 16-19 in Virginia. Spaf gave the keynote address at the Los Alamos Computer Science Institute (LACSI) Symposium in Santa Fe, October 28. On October 8, Spaf was presented with the U.S. Air Force medal for "Meritorious Civilian Service," in recognition of his work with the USAF Scientific Advisory Board. from 1999-2003. Spaf gave the keynote address, What Comes Next In Infosec Research? at the Cybersecurity Symposium in Colorado Springs, September 19. On September 17, Spaf is providing testimony to the House Committee on Government Reform Subcommittee on Technology, Information Policy, Intergovernmental Relations and the Census. The topic of the hearing is the role of software certification in obtaining software for the government. On September 9, Spaf gave the keynote address on Legal Challenges in the Cyber Future at the NAAG Cybercrime III Conference held at the University of Mississippi. Spaf was profiled in an article in the IEEE Institute's September issue. I spent 12 weeks over the academic year (2003-2004) as a senior advisor at NSF . I reported to the Assistant Director for CISE , Dr. Peter Freeman. I was there as an advisor and not as a program manager -- to provide some input and perspective, based on my 20+ years working in security and reliability within academia. Spaf was awarded the Hall of Heritage Award from the SUNY Brockport College Alumni Association. 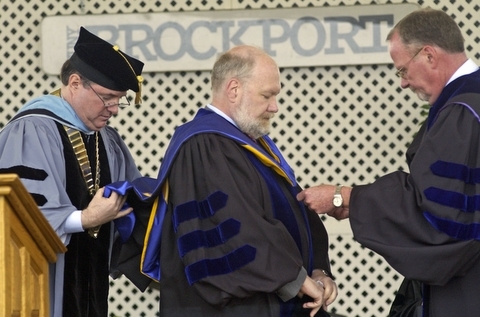 Brockport is where Spaf completed his undergraduate degree in 1979. This award is the Association's highest award for accomplishment and service. Spaf was named as an addition to the Purdue Book of Great Teachers . The formal induction was held August 28. This is a Purdue news story about it. On 9 May 2003, the White House announced that Spaf had been selected as a member of the President's Information Technology Advisory Committee ( PITAC ). Spaf is providing one of the three keynote addresses at the 2003 ICSE Conference in Portland, OR. His talk on the morning of May 8, 2003 is entitled Relating Software Engineering and Information Security . Microsoft Corporation has announced the formation of an academic advisory board to provide input to software assurance and privacy practices and plans at Microsoft. Spaf is one of 19 members of that board. The story has been described in a Microsoft press release . Air Force Institute of Technology, January 10. A handout of his presentation is available online. Spaf is giving the keynote address at the 29th annual CSI Conference in Chicago on November 12, 2002. Spaf appeared on " The Screensavers " show on TechTV on November 6, 2002. He spoke about computer security, and particularly about security in open software . On December 5, Spaf will present the Distinguished CISE Lecture at the National Science Foundation in Virginia. The title of the talk is Building Secure Software . Spaf has been named as a Fellow of the Purdue Teaching Academy , in fall of 2001. Spaf was one of four witnesses to testify before the House Science committee on infosec on October 10, 2001. 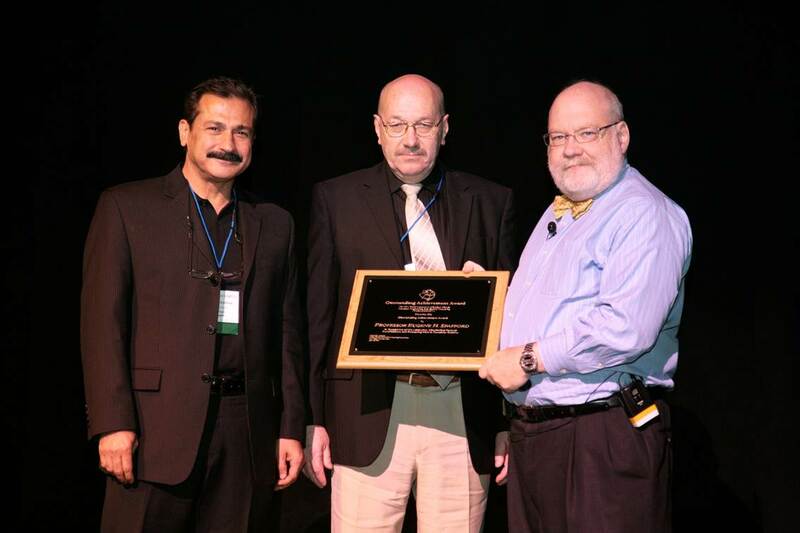 Spaf awarded the 2001 William Hugh Murray Medal by the National Colloquium for Information System Security Education ( NCISSE ). The medal is for career contributions to research and education in information systems security. Spaf was named to the ISSA Hall of Fame and made a Life Member. This recognizes his body of contributions to policy, research, and teaching in infosec, and to advancing the field. It is the highest award bestowed by ISSA. Spaf was named as one of the year 2001 recipients of the "Purdue University Outstanding Undergraduate Teaching Award in Memory of Charles B. Murphy." 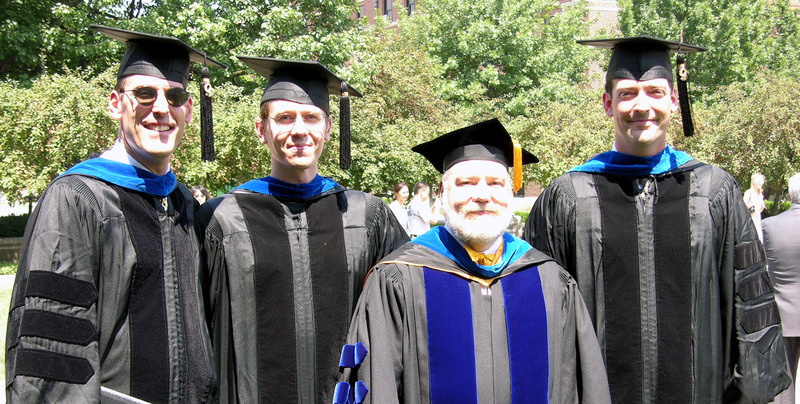 This award has been given annually since 1966 to recognize the most outstanding undergraduate teachers at Purdue. Spaf was one of the people named by USA Today as one of the People to Watch in 2001 . Spaf was named as a Fellow of the IEEE , effective January 1, 2001. In December, Spaf was named by Network World as one of the " 50 on Power's Edge ." This is their list of 50 after the top 25. In November 2000, Spaf was designated as an Honorary CISSP (Certified Information Systems Security Professional)q by the Board of Directors of (ISC) 2 . Spaf was selected as the 2000 recipient of the National Computer System Security Award. This provides some information on the award, and Spaf's comments upon receiving it.